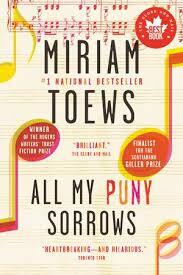 a book chick: "All My Puny Sorrows"
my take: Sometimes one picks a book by the reviews on the front covers - this is one of those times. It's a BEST BOOK according to The Globe and Mail. Winner and finalist of awards I'm not familiar with - but, hey, it's a Canadian author, so why would I know all the awards given by Canucks? Anyway, it paid off: great read by a Canadian author. It's the tale of two sisters who grow up in a tiny town in a strict Mennonite community. Each sister has creative gifts that will not be tolerated locally. It's the story of each of their passions, their reliance on each other, and their life choices. One of the cover claims is that it was "heartbreaking and hilarious." I did not laugh or cry during the reading ... two of the criteria for Sister and me ... however, I really liked this. I'd pick it for the happy look of the cover, so the reviews sound like a boon. I'll take a borrow, if I may!